Writers On The Move: Your Character's Smirking...or Is He? Synonym Pitfalls. 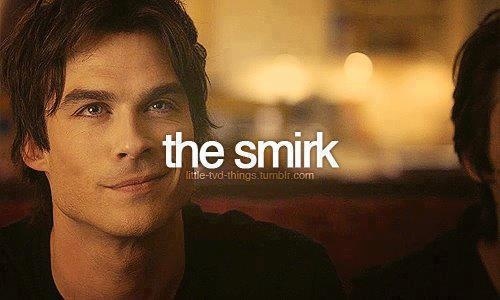 Your Character's Smirking...or Is He? Synonym Pitfalls. or killed someone's best friend. I've been running into a problem lately: characters I otherwise like are constantly smirking. I'm reading the third book now where this word appears in conjunction with friendly amusement, tenderness, or affection, and if I were sitting down with the authors, I might not be able to resist quoting The Princess Bride: "You keep using that word. I do not think it means what you think it means." To me, a smirk is cocky, smug, or cruel. At the very least, it's a teasing sort of smile, or a "hah! I got you!" Smirking is what the bad guy does as he pulls one over on your hero, not what your hero does when he tells the heroine that he loves her. But after so many counterexamples, I thought maybe I had my definition wrong. So I looked it up. Oxford: "to smile in an irritatingly smug, conceited, or silly way." Merriam-Webster: "to smile in an unpleasant way because you are pleased with yourself, glad about someone else's trouble, etc." Apparently back in the day it used to mean simply "to smile," but we're not back in the day, and even if you're writing historical fiction, it's a dangerous game to use an old definition of a word that now has quite a different meaning. I've come across the same thing with grin. To me, a grin is a big, face-scrunching smile, usually silly, mischievous, humorous, or teasing. It's not the kind of thing you usually do in, for example, a sentimental or bittersweet moment. Synonyms for 'laugh' can cause problems too. If your tough manly man giggles, that's interesting characterization. Maybe he's really a little girl at heart. Maybe he gets nervous easily in unfamiliar situations. But you'd better mean it if you use it. If a character guffaws at something that's not so funny to the reader, you might lose credibility. Unless, of course, over-laughter is part of his personality. Again, great characterization--but only if you mean it that way. I read a book where no one walked anywhere. Instead, everyone paced. They paced to the door, paced across the street, paced to each other. And I don't think they ever actually walked back and forth, which is what I think of as pacing. It was almost as if the author had been told not to use "boring" words like 'walk.' This author also rarely wrote 'small' or 'little,' replacing them instead with 'minute.' By the end, I was almost throwing things at my Kindle and yelling, "Stop pacing, you minute boy!" There are many, many sort-of synonyms for walk: stroll, stride, saunter, amble, trudge, plod, hike, tramp, march, stride, wander, ramble, tread, promenade, roam, traipse, take the air; advance, proceed, mosey, perambulate, etc, etc.. They all mean different things, and most can be good--in the right place. But if you start using one over and over--especially if it conveys the wrong meaning, you risk annoying your reader. And don't ever use "perambulate" unless you mean it to be funny. Gaze, glance, gape, stare, peer, peek, watch, examine, inspect, scan, scrutinize, consider, observe, ogle, espy, etc., etc. Again, most can be good in moderation, but the current book I'm reading had a line like this: "He glimpsed up quickly." No...to glimpse is to catch a quick look at something, usually before it disappears or you move past it. You can't glimpse up. Then there was this: "He glanced one eye over his shoulder." 'Glance' is intransitive (has no direct object). You can't glance something. You have to simply glance. Don't even get me started. Maybe I'll explore this subject next time. I'll just say now that if you use a dialogue tag like "admonished" or "theorized" more than once or twice in a book, reconsider. And if you insist on using lots of unusual synonyms for 'said,' make sure the meaning really fits the dialogue. Don't just use a word you randomly pointed at on your "synonyms for said" cheat sheet. Just because there is a synonym doesn't mean you should automatically use it, just to cut repetition or avoid "boring" words. Be sure that the synonym means what you think it means and that it won't make your reader think you're joking. (Ascertain that the synonym signifies what you postulate that it betokens and that it will not induce the peruser to opine that you're jesting.) And generally only use words that are in your active vocabulary. Else the danger is too high that you'll misuse them. Obviously, styles differ, and if yours is more flowery, more of these types of words might fit. Sometimes you can play with definitions and stretch words for creativity's sake. But you have to do it intentionally...and carefully. Perhaps the real problem is that we often write too many of these types of words to begin with. A critiquer friend of mine calls them "stage directions": all the looking, laughing, nodding, smiling words. Maybe it's best to simply cut down on them altogether. Then we won't have to rely on innacurate or laughable synonyms. Oh, dear, not another trend that makes it difficult for the author who isn't alert! Can't help myself here, Melinda. Writers will find all kind of these kinds of mistakes to avoid in The Frugal Editor (http://bit.ly/FrugalEditor). Wondering if you'll let me reprint this in my The Frugal, Smart, And Tuned-In Editor blog in a few weeks or months. If so e-mail me at hojonews @ aol dot com. BTW, I studied writing and music at Charles University in Prague. Is that where you are teaching? Carolyn, I'd be happy for you to reprint it on your blog. You studied in Prague? Awesome. For how long? I'm actually about as far as you can get from Prague, in a small town almost on the border of Slovakia, in a traditional area of the country called Wallachia (Valassko). Prague is beautiful, and there's so much to do and see, but I admit I love my corner of the Czech Republic more: wooden houses in little villages, sheep and chickens, folk dancing, great hiking, and people who are actually surprised and interested when they realize there's a tourist in town. I also love all those undiscovered gems like Olomouc and Tabor and Znojmo. Melinda, you chose the perfect image for the smirk! Great pointers on using the right words in story writing. I love your friend's term "stage direction" words. Good one, Melinda! Some of these words are my pet peeves too! Melinda, I agree with Karen. Your image portraying a smirk is ideal. However, just before I sent off my Google+ promo, I noticed it said emphatically. "This is a smirk!" and it showed your photo. LOL! It gave me a chance to add to your post - "This author's smile is NOT a smirk. If you want to see a true one, follow the link." Maybe that's something we need to watch out for when we promote each other's posts!